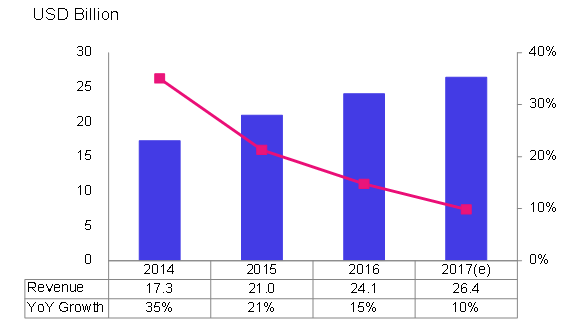 The market size for the global digital games market is approximately USD 99.4 billion in 2016, and is expected to exceed USD 100 billion in 2017, according to Taipei-based IT research institute MIC (Market Intelligence & Consulting Institute). "The steadily growing global digital games market can be mainly attributed to the e-sports tournaments and game companies," says Jessica Hsu, industry analyst with MIC. "With a market share of around 47% in 2016, mobile game is the largest segment in the Chinese digital games market. “The rapid development of mobile games has popularized various game genres and has attracted users across all ages, genders, and professions, creating more balanced user demographics."